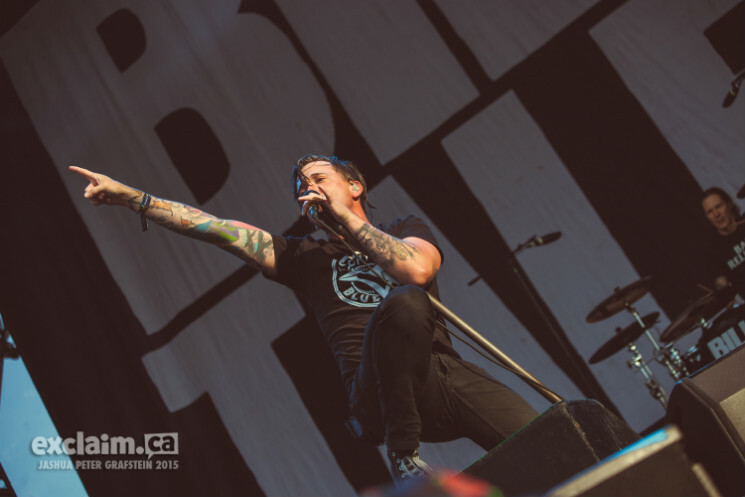 The crowd for Toronto-bred Billy Talent was raging well before the band even took the stage. Bets placed on "River Below" ricocheted off the various corners of the pit, and arguments broke out over which favourite the band would open with. Impatience swept through, with impromptu clapping and a chant of "Billy! Billy!" that lasted longer than necessary. It wasn't "River Below" but "Devil in a Midnight Mass" that sent the crowd into a frenzy, opening a mosh pit stage right. Frontman Ben Kowalewicz, repping a Toronto Blue Jays tee and humble as always, threw out a cheeky dedication to the Vancouver Canucks before launching into "This Suffering." Equally charming was a high five to the firefighters of BC and elsewhere battling the forest fires in the province, one of which was raging some tens of kilometres from Pemberton earlier this month — a fitting tribute to roll into "Rusted From the Rain." "River Below," when it finally dropped, set off a crowd-wide sing-along, Kowalewicz leaving the chorus up to the masses. The closer was fan-favourite and the band's first commercial single, "Try Honesty," a powerful note to go out on from one of the most charming acts on the bill.